"Been a long time," she says. "Like riding a bike," Raynor says. "Yep," she says. "Like riding a bike." That's StarCraft II: Heart of the Swarm. The first thing you should know about Heart of the Swarm—or at least the single-player campaign of Heart of the Swarm—is that you can't take it too seriously. Feel free to snicker at some of the deliciously cheesy banter, and by all means fall in love with the cast of characters, who are great, but don't waste any brainpower giving serious thought to the story. See, if you start taking Heart of the Swarm's campaign seriously, you start asking questions like "Why is Raynor suddenly in love with Kerrigan when they barely knew each other before she turned into a Zerg?" and "Didn't Raynor vow to destroy Kerrigan for killing millions of people?" and "Psi Disrupter? Why is there ALWAYS a Psi Disrupter?" The lack of answers will just drive you mad. Like a popcorn flick or episode of 24, StarCraft II: Heart of the Swarm's story is fun and entertaining, so long as you don't think too hard. Which is okay! Just don't expect much. Heart of the Swarm, an expansion to 2010's Wings of Liberty (and part two of what will be the StarCraft II trilogy), begins where the first game left off. Thanks to Raynor, Kerrigan is no longer the most terrifying creature in the galaxy. The Queen of Blades is now the Queen of Fleshy Limbs. And she's been captured in a Terran prison, trapped while the humans try to figure out what to do with her. As tends to happen with prisons, there's an attack and a big explosion, and eventually Kerrigan escapes to a distant planet. She receives some troubling news about her buddy Jim Raynor, and she decides that it's time to enact vengeance on the treacherous Arcturus Mengsk, who has been a grand and menacing villain in the StarCraft universe since Brood War back in 1998. WHY: Because it's more StarCraft. What I played: Completed the single-player campaign in 11 hours. Played around with multiplayer extensively during the beta, and a little bit today. Uh oh. I'm asking questions again. Let's move on. Okay. 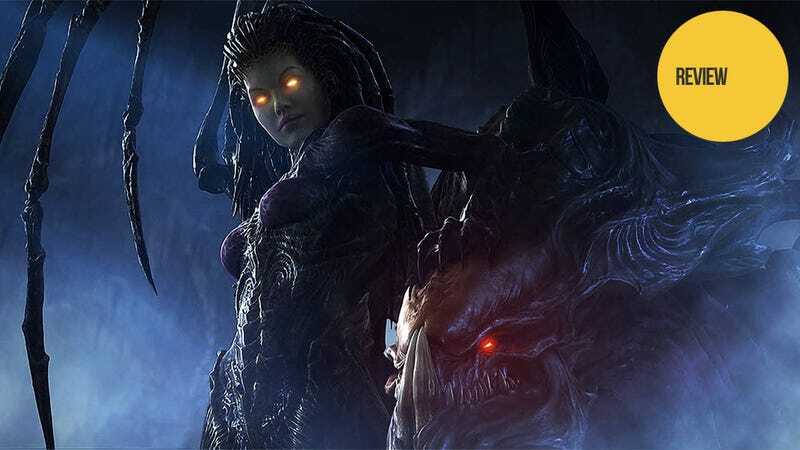 Kerrigan and Raynor are separated by a lot of nasty obstacles, like Mengsk's Terran forces, rogue Protoss armies, and even rival Zerg swarms that need some coercing before they re-accept Kerrigan as their leader—and, yeah, Kerrigan has decided to become leader of the Zerg again. Kerrigan's psyche is less stable than SimCity. In an attempt to reunite with her now-long-lost lover, Kerrigan must build up her new swarm over the course of 21 missions (and 6 supplementary "evolution missions" that are more like glorified tutorials that didn't need to be missions at all). Some of these missions are pure StarCraft: you build up an army and use it to attack or defend your base from another army. Others are more creative: you get to defend a tram's engines from enemy ships, fly a battlecruiser through space and even fight boss battles—yes, boss battles!—on the ancient Zerg homeworld of Zerus. The good thing about Combat Kerrigan is that she's a blast to control; she can blow up marines with her mind, heal allies, and eventually summon a massive Zerg whale that punctures everything in sight with its tentacles. And in a game where you throw around thousands of Zerg soldiers like they're disposable toys, it's comforting to have at least one recurring hero to care about. Exacerbating this whole "Heart of the Swarm is way too easy" problem is the fact that every single mission gives you very specific instructions about what to do and where to do it. When you're not building and recruiting, you're following arrows and doing what the game tells you to do. Bring this drone here. Leap on this enemy there. There are optional side-quests, yes, but they're almost always marked on your mini-map, and they're way too easy to find and finish. But it's still StarCraft. It's still a joy to go through the now-familiar ritual of training and killing, and even the easiest missions are designed with the attention to detail that we've grown to expect from this series. Every single mission is interesting in some way. And even the easier moments exercise your mind in the way that only a real-time strategy game can. As Raynor points out, it's just like riding a bike. Raynor: "My hair's got more grey in it." Kerrigan: "And my hair's got more Zerg." The game—not the interactive story, but the set of rules and conditions that form the basis of StarCraft II: Heart of the Swarm—has grown into a classic, an eternally replayable e-sport that you could seriously compare to chess or even football without making people snicker. (Good luck doing that in 1998.) I have played thousands of matches in StarCraft and StarCraft II over the past decade and a half, and I don't think I'll ever get sick of it. Some people prefer to play against the computer. Other people like to hop online and delve into custom maps. (SCII ships with a map editor, and tons of friendly modders have hacked up all sorts of crazy scenarios that you can play online for free.) But you really haven't played StarCraft until you've played it against other people. Forget Raynor and Kerrigan: it's other human beings who make StarCraft II great. Two people starting off on a level playing field and fighting to see who's better—not who's luckier, or who spent the most time grinding for gold, but who's better. Who's better at mastering the rules and figuring out how to outsmart their opponents in a game that's as demanding as any sport. Heart of the Swarm brings with it more units, more buildings, and some heavy-duty tweaks—siege tanks don't need research for siege mode anymore!—that will change the multiplayer game for years to come. And in another 15 years, I imagine we'll all still be playing it.